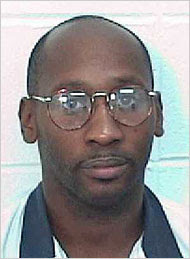 (FinalCall.com News)–When the news of his third stay of execution came down the news wire, Georgia death row inmate Troy Davis immediately called his eldest sister Martina Correia to share his thoughts about the spiritual significance of why his life is being spared while others want to take it away. On Oct. 24, the 11th U.S. Circuit Court of Appeals issued a 25-day stay of execution for Mr. Davis who had been scheduled to die on Oct. 27. Earlier in the month, the Supreme Court rejected an appeal from Mr. Davis. He was scheduled to be put to death in September before a stay was issued just two hours before the time of execution. Mr. Davis, a Black man, was convicted in 1991 of the murder of White Savannah police Officer Mark MacPhail three years earlier. He has always maintained his innocence and his case has drawn worldwide attention and support. Witnesses claimed Mr. Davis, who was then 19 years of age, and two others were harassing a homeless man in the parking lot of a Burger King restaurant when the off-duty officer arrived to help the man. Witnesses also testified at trial thatMr. Davisthen shot Mr. MacPhail twice and fled the scene. Since Mr. Davisâ€™ 1991 conviction, seven of the nine witnesses against him have recanted their testimony and no physical evidence has been presented that links Mr. Davis to the killing. 7-Year-Old Aiyana Jones Shot by Police in Her Sleep. Why? Don’t Forget: White vigilantes shot at Blacks on sight…..what can you do about it?